I’ve been quite busy the last few days. I have visitors from out-of-town (so fun, but I feel like death! ), contractors all up in my crib (argh, drilling and banging at eight in the morning! ), new projects at work (I need a raise! ), and I’m going to court tonight (wish me luck!). But because I love you guys, and because tomorrow is National Doughnut Day, I thought I’d write a short post about the doughnuts I ate this weekend. As many of you know, I’m not crazy about doughnuts (Doughnuts remind me of being forced to got to church when I was little. After church there were always doughnuts. The smell of powdered sugar now makes me want to puke. I have issues, don’t judge. ), but I’m completely smitten with the doughnuts at the Doughnut Plant. I like their doughnuts because they actually taste like something beyond sugar, flour, and grease. Before this weekend, the square jelly-filled was my favorite, but now I’m in love with the Peanut Butter Glaze & Blackberry Jelly Yeast Doughnut ($2.75). It’s their squishy square yeast doughnut filled with organic blackberry jelly, lightly glazed with sugary peanut butter, and sprinkled with chopped nuts. It’s sweet, but not overly so, and has the perfect proportion of peanut butter flavor to jelly; more jelly than peanut butter, just how I like my pb&j sandwiches. I also had a sugar glazed Mango Cake Doughnut ($2.25). I never get too excited about the cake doughnuts at Doughnut Plant. There’s nothing wrong with them, but if I want cake, I rather go to a bakery. 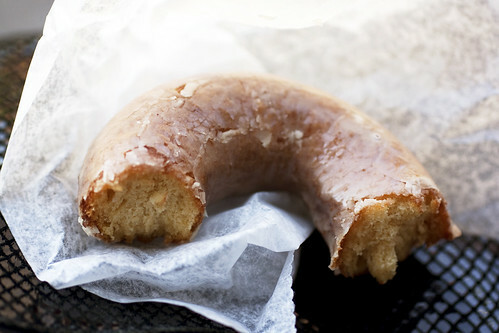 I want my doughnuts to be airy and fluffy, like little fried pillows, not like dense cakes. The Mango was moist with a subtle mango flavor, and the sugar glaze was nice and light, but again it was a cake doughnut, it didn’t wow me. Next week, I hope to be less busy so I can post more, but until then, Happy National Donut Day! Eat a doughnut or two, and let me know in the comments if you come across an especially delicious one. Share the love please. Love that top photo, really want that doughnut. I have never seen doughnuts like that in my life (used to see only Dunkin, saw them at church after service growing up as well). I need to get to the Lower East Side more often. So glad you posted this! Absolutely smitten with their apple cinnamon yeast donuts (around Thanksgiving), although I can’t say I dislike any of their ever changing flavors. Hmm… any opinion on Mister Donut? Happy National Donut Day! I just had two donuts and a coffee from Dunkin Donuts. Doughnut Plant is great, they have such an interesting selection. Good luck in court, maybe you should bring some donuts. i was wowed by the freeness of my krispy kreme donut this morning. awesomes! @Connie – Ahhh!!! What’s up with church people and Dunkin Donuts! Definitely check out Doughnut Plant. They make the only doughnuts I ever crave. @Nicholas – Ooh, I saw MD in Seoul, but I didn’t try it. There was just too much other stuff to eat! @someguy – Court sucked. I have to go back in a few months. I think the other guy may win on a technicality…. No doughnuts for him!!! @Danny – Freeness is sweet! 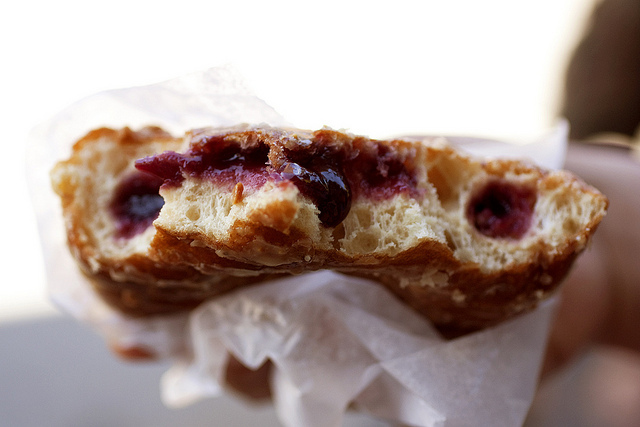 Randomly ran into your site and wanted to say GREAT FOOD PHOTOS…and yes happy national donut day. Donut plant is my fav but, waiting to try peter pan donuts. this place is pure bliss. the texture of these chewy doughnuts is unparalleled! Have you tried Holey Cream? THey offer the donut sandwich (scoops of ice-cream sandwiched between a selected donut). This creation is offered at Peter Pan as well. Good luck at court! Great, I just read your doughnut post and Doughnut Plant is not open on Mondays ! LOL -=( boo….I love their coconut creme doughnuts! @Chris – Never tried Peter Pan donuts. Must try! Especially since Tina Fey wants to violate them! @c – Yes, I love the chewiness too. @kim – OMG, looks like I need to go to Peter Pan soon! @wonders – Tomorrow is another day! Btw, I’ve like just discovered your blog and I must say I’m really impressed by your food-photography skills. These pics look fabulously tantalizing!! @Eileen – Thanks, and yes, I want summery flavors too!